It’s been the accepted wisdom to soil test as late as possible in the fall, but one soil test lab says it might pay to go earlier. 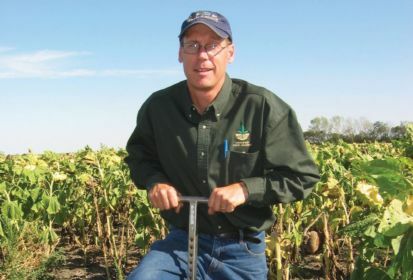 Agvise Laboratories, that has soil-testing labs in North Dakota and Minnesota and a large stable of Canadian customers, told growers in a recent email it may be a sound strategy to soil test right after the combine. The company added it’s done several sampling date projects over the past 25 years, which show the soil nitrate level in wheat fields is very stable all fall. Researchers from North Dakota State University also recommend soil sampling right behind the combine to get the best-quality soil samples, Agvise said. Manitoba Agriculture soil fertility specialist John Heard agrees. It provides very stable nitrate test levels. It gives the highest-quality soil sample before any tillage occurs. Sampling an undisturbed soil profile means accurate depth control. Sample depth control is important for getting consistent results for tests such as phosphorus, potassium, zinc and organic matter percentage from year to year. It reveals the nitrate level in the soil profile before volunteer grain starts taking up nitrogen a few weeks after harvest. It allows more time to make plans for variable-rate fertilizer applications. It ensures that each field gets sampled, avoiding bad weather, which can prevent sampling later in the fall. Ideally sampling would occur in spring just before the crop is planted, but it doesn’t give farmers enough time to plan, Heard said. If it’s a wet fall, which can result in nitrogen leaching, a farmer can adjust their fertilizer application rate, or resample, Heard said. By starting earlier soil-testing services can also do a better job, Heard added. With more acres of soybeans and corn, which mature later and are harvested later, there’s less time to get all the sampling done before freeze-up. Soil test results are just the start of the planning phase for farmers, he said. Farmers need to take other factors into account such as potential yield, whether the fertilizer will be applied in spring or fall and whether it will be banded or broadcast. “It’s nice to wait until you are at the finish line to make your decisions, but you may not have time to do that so you have to sample earlier,” Heard said. “And that allows the soil test industry a head start. Steve Barron, business development manager in south-central Manitoba for crop input supplier Double Diamond, is seeing more interest in earlier soil testing. “A lot of our customers plan on applying fertilizer in the fall and need the results,” he said. “When a guy takes a soil test core when the field has been worked the consistency and the depth of the core are so marginalized. If you can take it before the field is worked the depth and the consistency are so much more accurate and what you learn from it is so much better. — Allan Dawson is a reporter for the Manitoba Co-operator at Miami, Man. This article first appeared in the Aug. 18, 2016 edition of the Manitoba Co-operator (page 17).